Last week, I saw some Oreos in my cabinet while searching through my ingredients to see what else to make. And since Oreos are so popular, why not throw chunks of them into a cookie just like we do with chocolate chips and nuts? So, I got started. These are a lot like soft chocolate chip cookies, but with a couple of minor changes to incorporate a slight cheesecake flavor from the instant pudding mix, and of course the chunks of Oreos throughout the cookies…and of course, the crumbles on top. After these came out of the oven and they cooled for a few minutes, I couldn’t resist…and ate one. Then another. And another. As the day went on and I counted up six cookies that made their way into my belly, that was it. The next morning, I asked my husband if he could take them into work with him. He agreed, and I said, “Good! Because I ate six of those suckers yesterday, so they gotta get out of this house before I eat any more.” His coworkers were happy to help out. Preheat oven to 350 degrees. Cream the butter, white and brown sugar together using electric mixer. Add eggs and vanilla, beat until combined. Add flour, cookie crumbs, salt and baking soda, mixing well. Stir in Oreo chunks, and crush remaining cookies into fine crumbs. 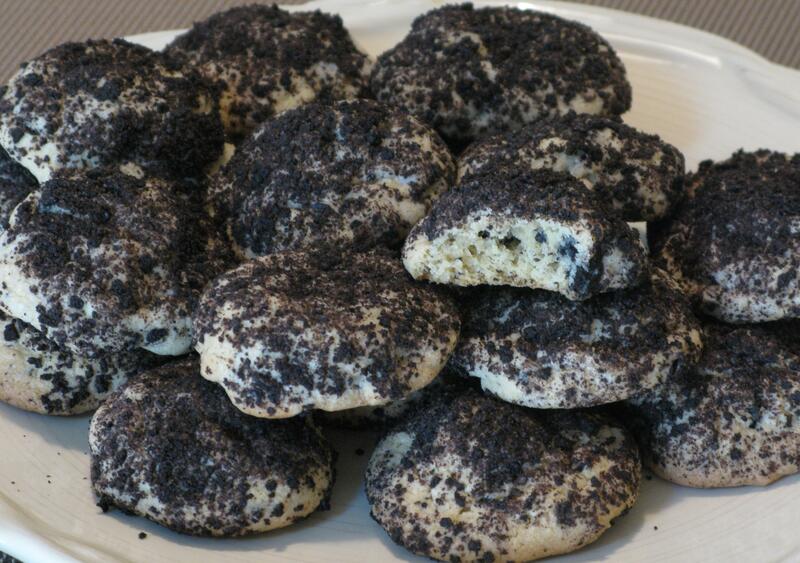 Using a cookie scoop, scoop out dough and roll tops in Oreo crumbs. Distribute on baking sheet and bake for approximately 12 minutes, until tops of cookies are a very light brown. *When making Oreo cookie crumbs, I break up Oreos and put them in a food processor or food chopper to get the fine consistency to use in the cookies. If you don’t have either of these, break up some Oreos, put them in a Ziploc freezer bag, and beat the mess out of them until they turn into crumbs. Great way to relieve stress, while making cookie crumbs.